By the backpacks filled with kid’s stuff, the annual cardiac check-up for the Bennet family from East London seems like just another casual fun day out. 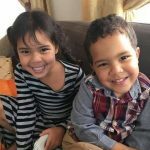 Both children have had open heart surgery at Cape Town’s Red Cross Children’s Hospital to correct their condition, Mikenza at six months and her brother at five months. This is their annual check-up. Parents Elize and Craig seem to have the preparations down to a fine art. They’ve seen their children through stints in private and State hospitals in East London and Cape Town. Initially, Mikenza was diagnosed by a private doctor who referred the family to Dr Maurice Levy at Frere. They’ve been consulting with Levy ever since, although Mikenza’s first operation was performed by Dr Susan Vosloo at the private Christiaan Barnard Memorial Hospital in Cape Town. Although they’ve had a long wait in the queue outside, Mikenza, 7, and Kellan, 4, seem to pass through the examination room itself in a flash and the relief at another positive milestone is visible across their parents’ faces as they leave the hospital. Beautiful family. One thing about CHD children their smile yhoooo.